More than 160,000 people applied to hike The Wave last year. Only a few thousand got in. Ranger Ron Kay glanced at an eager crowd crammed into a U.S. Bureau of Land Management office in Kanab. 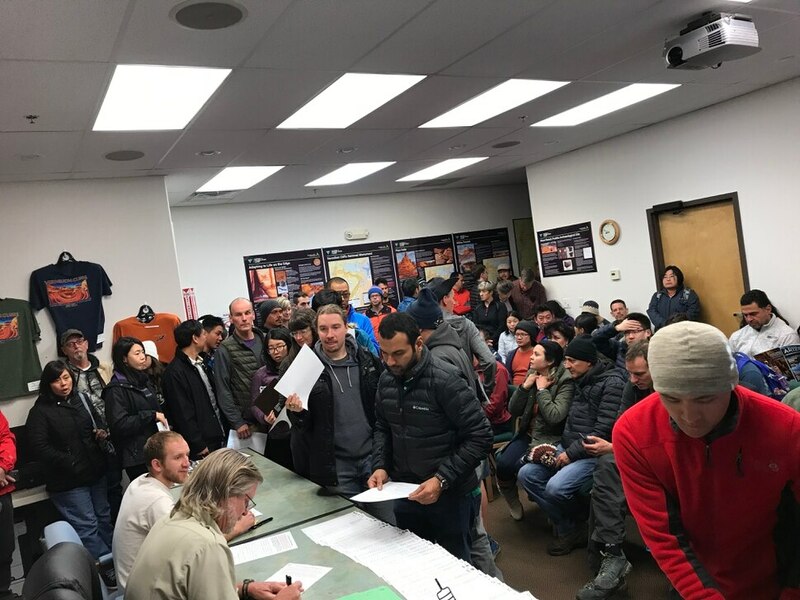 “All these hopeful faces,” he murmured as the minutes counted down to a drawing for permits to hike to The Wave, an iconic basin of striated orange sandstone just south of the Utah-Arizona state line. More than 80 applications were stacked in front of Kay on this Thursday morning in late December, with up to six names on each request. Only 10 people would get permits. Losers could try again, but the next day, nearly 400 applications poured in. That was incompatible with growing interest in The Wave. The Wave, a rock formation near the Utah-Arizona border, is rapidly gaining fame as one of the most spectacular destinations in America's southwest. But only 20 people per day are allowed to visit. Permits are granted through online lotteries and in-person drawings — and both are becoming more and more competitive each year. Jennifer Kumar, who filmed the jampacked drawings in December, said she arrived to find the visitor center parking lot overflowing and applicants spilling into the hallways and even outside. Images of the formation have circulated for years in international travel literature, but demand for permits recently has skyrocketed. Explorers in redrock country — some of whom have applied for Wave permits dozens of time to no avail — say their hopes are dwindling that they’ll ever get a chance to see this natural wonder. Fantastically photogenic • Even among the stunning geological highlights of the Kanab area — Buckskin Gulch, the Wahweap Hoodoos, the White Pocket rock formations in northern Arizona — The Wave is unique. The hike, which crosses the state line in the Paria Canyon-Vermilion Cliffs Wilderness, is less than 3 miles one way; the road to the trailhead is not as hair-raising as some in the area; and the topography is compact and fantastically photogenic. In 2017, more than 160,000 applied for the year’s 7,300 permits into the 1,600-acre Coyote Buttes North permit area that encompasses The Wave and other formations — nearly double the requests five years earlier and a 20 percent jump over 2016. The chance of winning an online lottery during the busiest months last year was less than 2 percent. In the most recent online lottery, held last week to award May’s permits, some 2,800 people vied for the 10 slots on May 5 alone. The worsening odds have not deterred committed hikers from applying again and again. Steve Sykes, a physician from Dothan, Ala., said he began applying in 2012, when he saw a blurb about The Wave in a magazine. Six years later, he’s still trying. He applied online in January for May 1-3 in last week’s drawing; each applicant can request up to three days every month. Up against more than 1,800 people for each of those days, Sykes received the disappointing news last week: Unsuccessful. Again. Weighing the odds • The odds are better for those who apply in person. Hikers can show up at the Kanab visitor center for a 9 a.m. daily drawing for a permit for the following day. In the past, this was seen as a reasonable chance to snag a last-minute permit, especially for locals and especially in winter. But with tourism to southern Utah exploding, some visitors say the drawing is not worth the lost hour. For those who try their luck at the visitor center, the scene has grown increasingly dramatic. Applicants wait with bated breath as numbered balls drop out of a bingo cage. Gasps and yelps of joy accompany victories, Kumar said. The crowd groans when a winning application is for a group; a single bingo ball can wipe out six of the day’s 10 slots. Permit-winning solo hikers earn sighs of relief. 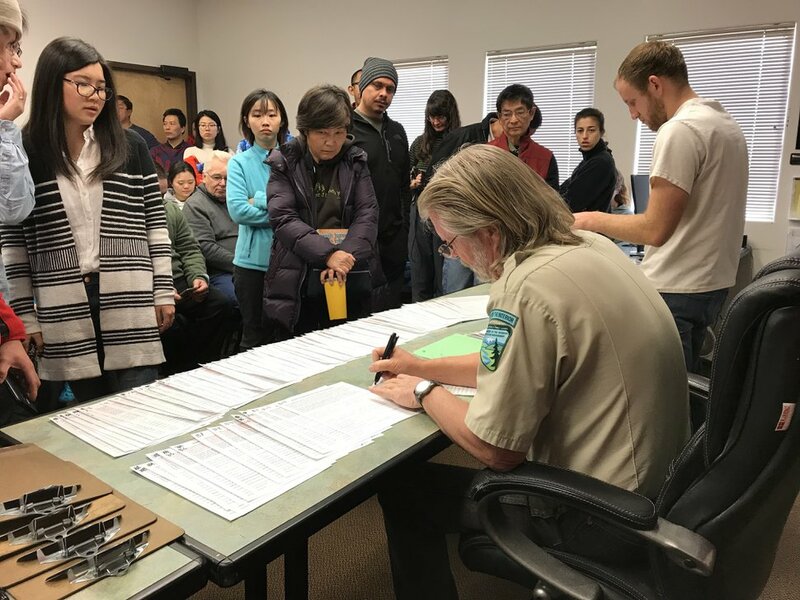 (Jennifer Kumar | Courtesy) Hopeful hikers crowd into the U.S. Bureau of Land Management's Kanab visitors center Dec. 28, 2017 to apply for a permit drawing to visit North Coyote Buttes, which includes The Wave rock formation, at the Utah-Arizona state line. Artist Cory Cravatta tried his first walk-in drawing in July, when high temperatures and a couple of online cancellations meant only 17 hikers were in the running for 12 permits. Cravatta wasn’t picked. In retrospect, he said, it’s probably just as well. Summer can be a dangerous time to hike to The Wave; in 2013, three hikers died from the heat in less than a month. But Cravatta didn’t give up. Traveling for long stints away from his home in Genoa, Ill., he plotted his road trips to crisscross Kanab. By mid-January, he had applied for six months of online lotteries and had entered the walk-in drawing 24 times. Having watched crowds at the permit drawings explode from 17 in July to well over 100 on some days in January, Cravatta saw his hope running out. On Jan. 16, he decided to give it two more tries and call it quits. On that Tuesday, just 36 people were drawing for the 10 permits. Rangers had told them about Cravatta’s many attempts. Office staffers told him they were praying for him. Cravatta thought back to the many hikers he’d seen win on their first and second tries. Finally, he got his permit. “Other people actually clapped when my number got drawn,” Cravatta said. The next day, he was teetering over the swirls of sandstone, willing away vertigo and snapping about 100 pictures. Even after his exhaustive efforts to score a permit, Cravatta said he doesn’t want the BLM to open the floodgates to more tourists. Twenty visitors a day, he added, is enough. 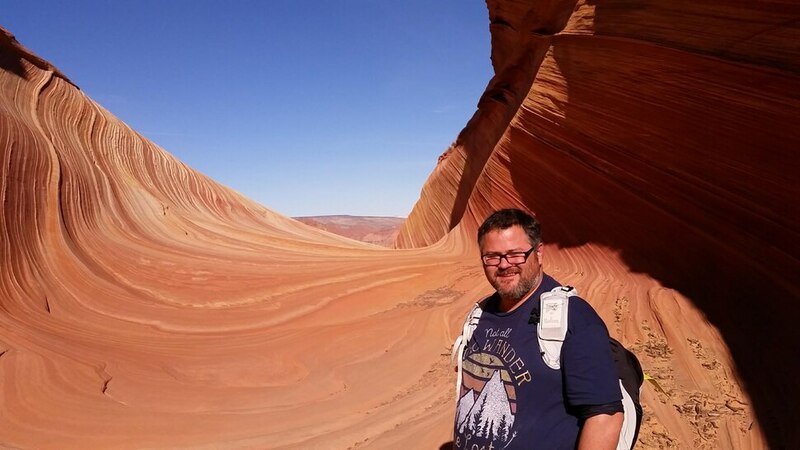 (Cory Cravatta | Courtesy) Hiker Cory Cravatta, of Genoa, Ill., applied 30 times to obtain a permit to hike to The Wave rock formation at the Utah-Arizona state line. He finally won a permit to hike to the iconic site on Jan. 17, 2018. Only 20 people per day may visit North Coyote Buttes; 10 permits are granted at a daily drawing in Kanab, and 10 are distributed in an online lottery.